A regular breeding resident and migrant; occasionally has been observed lingering into early winter at bird feeders in Minnesota. Cape May Warblers were uncommon during the Minnesota Breeding Bird Atlas (MNBBA). Found patchily distributed across Canada from Labrador to British Columbia and in the northern portions of the Upper Midwest and the northeastern United States. Highest densities have been observed in eastern Quebec and central Ontario (Figure 1). Assigned a Continental Concern Score of 13/20 by Partners in Flight. The Cape May Warbler is a Partners in Flight Yellow Watch List species because of a steep decline in its population and several threats. It is also listed as a Species in Greatest Conservation Need by the Minnesota Department of Natural Resources. Long-distance migrant overwintering in the Caribbean, southern Mexico, and Central America. Invertebrates including insects (especially caterpillars such as spruce budworm), spiders, and fruit and nectar during the winter. Forages primarily while perched but also known to hawk, hover, or fly-catch for prey. Cup nest usually high in a coniferous tree and close to the trunk. Breeding distribution and relative abundance of the Cape May Warbler in North America based on the federal Breeding Bird Survey from 2011 to 2015 (Sauer et al. 2017). In Minnesota, Roberts (1932) quizzically stated about the Cape May Warbler that “if nesting at all in Minnesota it must be in very limited numbers and in restricted localities.” His only report of potential nesting activity was an observation by T. Surber on June 19, 1919. Surber observed 3 or more pairs in Pine County that he described as behaving with “actions” that provided evidence of a nest nearby. Roberts also reported a Cape May Warbler specimen taken on July 16, 1914, near Gabbro Lake in Lake County by Dr. C. E. Johnson. Years later, Green and Janssen (1975) reported that Cape May Warblers were primarily a resident in the northern part of the northeastern region of Minnesota. Observations during the breeding season had been noted as far south as southern St. Louis County and west to Itasca State Park. They identified confirmed nesting in northern St. Louis County and inferred nesting in Cook County. A few years later, Janssen (1987) described the Cape May Warbler’s distribution as primarily the northern part of northeastern Minnesota in “normal” years but stressed that its numbers can fluctuate widely with spruce budworm outbreaks. During these infestations, the species can be found in scattered locations in northeastern and north-central regions of the state. Janssen did not identify any confirmed nesting since 1970 but outlined its breeding distribution from Cook County to Clearwater County, northwest to eastern Roseau County, and southwest to northern Hubbard County; the southern boundary was defined by northern Itasca and southern St. Louis Counties. Hertzel and Janssen (1998) included only St. Louis County with a confirmed nesting record since 1970. The Minnesota Biological Survey (MBS) recorded 155 breeding season locations for the Cape May Warbler (Minnesota Department of Natural Resources 2017). The vast majority of their locations were clustered in northern St. Louis and western Lake Counties. One location each was found in southern Lake and St. Louis Counties, and two were found in northern Aitkin County. These locations probably coincided with the distribution of spruce budworm outbreaks at the time of the MBS fieldwork. The MNBBA reinforced that the major breeding distribution of the species is in the northeastern counties of St. Louis, Lake, and Cook but reported possible nesting as far south as Morrison County, west to Becker County, and northwest to Beltrami and Roseau Counties (Figure 2). The MNBBA extended the distribution presented by Janssen (1987) farther south in north-central Minnesota. The Cape May Warbler was confirmed nesting in 11 blocks within Lake, Lake of the Woods, Roseau, and St. Louis Counties. There were 59 blocks (1.2% of surveyed blocks) with probable nesting, which included the 4 previously named counties plus Aitkin, Cook, Itasca, and Koochiching (Figure 3; Table 1). Possible nesting was reported from an additional 169 blocks. Baltz and Latta (1998) reviewed the Cape May Warbler in North America. They attributed historical changes in the distribution of the species to responses in budworm outbreaks. In Wisconsin, Cutright et al. (2006) found that the species’ population fluctuated in response to spruce budworm populations, especially in the southern margins of the breeding range. They confirmed nesting in 10 counties in northern Wisconsin from Douglas to Door Counties. In Michigan the story was similar. Nesting was not confirmed until the 1970s. The first atlas, from 1983 to 1988, identified breeding evidence in 137 townships, mostly in the Upper Peninsula, but also in the northern Lower Peninsula (Chartier et al. 2013). They noted that no significant changes were found between the state’s first atlas (1983–1988) and second atlas (2002–2008). The distribution of the Cape May Warbler in Ontario was similar to Michigan’s. There was no significant change in Cape May Warblers in the northern regions or in Ontario as a whole between its first atlas (1981–1985) and its second (2001-2005), but there was a significant decrease in the second atlas within the province’s southern regions. The decline was largely attributed to the lower incidence of spruce budworm during the second atlas. Morse (1989), primarily from his research in the northeastern United States, suggested that Cape May Warblers may have been at or near their maximum historic population levels in the 1980s. It is unclear whether this observation is applicable to the northern Great Lakes region. The historical status of the Cape May Warbler is difficult to assess in Minnesota. The atlases from Michigan, Ontario, and Wisconsin all note the difficulty in censusing the species and in the identification of its nesting behavior. The Cape May Warbler’s song is high, weak, and usually delivered high on the top of a coniferous tree, often in remote areas. Its nest is hidden high in a coniferous tree near the trunk, where observation is almost impossible, or as noted by Roberts (1932), where the nest is “invisible from the ground.” Thus, the documentation by Cottrille (1962) is impressive; her party was able to identify “eight small young three or four days old” that were “three and one-half feet from the top of a 23.5 foot black spruce.” They discovered the Cape May nest after eight days of searching in an area with a spruce budworm outbreak. Fortunately the nest was only 20 feet high in the tree, so it was possible to observe. In summary, the status of this species begs for additional research, but it is a challenging task to study a species that is rare and highly variable in its population and distribution. Breeding distribution of the Cape May Warbler in Minnesota based on the Breeding Bird Atlas (2009 – 2013). Summary statistics of observations by breeding status category for the Cape May Warbler in Minnesota based on all blocks (each 5 km x 5 km) surveyed during the Breeding Bird Atlas (2009-2013). Summary statistics for the Cape May Warbler observations by breeding status category for all blocks and priority blocks (each 5 km x 5 km) surveyed during the Minnesota Breeding Bird Atlas (2009-2013). The haunts of the Cape May Warbler are generally described as a variety of medium- to old-aged coniferous habitats with spruce and balsam fir (Baltz and Latta 1998; Figure 4). The habitat profile developed from data gathered during the random point counts showed a distribution dominated by upland coniferous forests with substantially fewer detections in bogs and lowland coniferous forests (Figure 5). The National Forest Bird (NFB) monitoring program in the Chippewa and Superior National Forests recorded a majority of observations from aspen-spruce-fir stands with additional observations from aspen-birch, jack pine, coniferous swamps, and white pine stands (Niemi et al. 2016). Most of these stands were of mixed types with varying densities of white spruce and balsam fir trees. In the extensive counts in the Agassiz Lowlands Subsection in northern Minnesota, Cape May Warblers were very rare (Bednar et al. 2016). They were also rarely found during extensive coverage of the Red Lake Peatland area of northern Minnesota in the late 1970s and early 1980s by Niemi and Hanowski (1984) and Warner and Wells (1984). Brewer et al. (1997) in Michigan largely recorded the species in wet coniferous bogs dominated by black spruce, while in Wisconsin, Cutright et al. (2006) had most records of Cape May Warblers in upland mixed forests, upland coniferous forests, and lowland coniferous forests. Grinde (2015) in an analysis of colonization and extinction dynamics by forest patch sizes found that the Cape May Warbler had an increased probability of colonization in small forest patches. This finding seemed to coincide with the species’ use of sites highly disturbed by spruce budworm, which produced open areas and associated edges. Typical breeding habitat of the Cape May Warbler in Minnesota (© Gerald J. Niemi). Habitat profile for the Cape May Warbler based on habitats within 200 m of point counts where the species was present during the Minnesota Breeding Bird Atlas (2009-2013). The North American population estimate of the Cape May Warbler by Partners in Flight (Rosenberg et al. 2016) was 7 million breeding adults. An earlier estimate by the Partners in Flight Science Committee (2013) was 30,000 in Minnesota. However, estimates by the MNBBA for Minnesota were substantially higher, approximately 852,000 breeding adults (95% confidence interval of 606,000 – 2,012,000) . These estimates were made when populations were on the rise in Minnesota’s Superior National Forest, where most of the state’s population occurs. Environment Canada (2014) estimated a broad range of 5 million to 50 million adults in Canada, where the bulk of this species’ breeding population exists. The high variation in population estimates is a strong reflection of the association of this species with outbreaks of spruce budworm, a highly variable food source. In addition, Cape May Warblers have a large clutch size, 6 on average, so they are adapted to take advantage of high populations of an available food source. The federal Breeding Bird Survey (BBS) was unreliable for estimating population trends of the Cape May Warbler in Minnesota and its neighboring states. The trend estimates for Canada and survey-wide both indicated a significantly declining population of 2.56% per year and 2.51% per year, respectively, from 1966 to 2015 (Figure 6). Partners in Flight has estimated a 76% decline in Cape May Warbler populations from 1970 to 2014 (Rosenberg et al. 2016). Contrary to the BBS surveys, the NFB monitoring program detected a significantly increasing trend of Cape May Warblers in the Superior National Forest of 6.6% per year (Figure 7). These trend data indicated a decline in the population from 1995 to 2001 but a substantial increase from 2001 to 2016. The discrepancy between the survey-wide trends from the BBS and the Superior National Forest trend is largely due to the NFB program’s tracking of a regional population increase resulting from a growing spruce budworm outbreak in northeastern Minnesota. No quantitative studies of Cape May Warbler populations have been published in Minnesota. In northern Ontario over a 40-year period densities ranged from 70 pairs per km2 in the 1940s, to 0 pairs per km2 in the 1950s, to 148 pairs per km2 in the 1980s (Kendeigh 1947, cited in Baltz and Latta 1998). Cadman et al. (1987) also reported similar fluctuations, which ranged from 34 pairs per km2 in 1979, to 370 pairs per km2 in the early 1980s, to almost none in 1986. 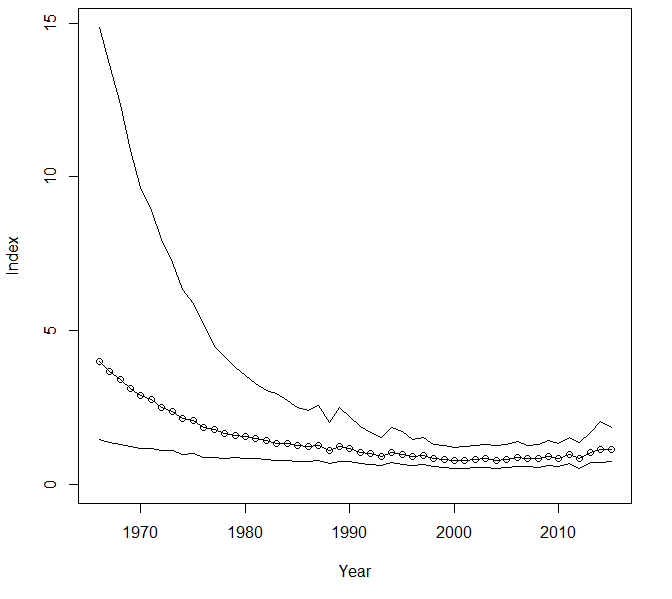 Breeding population trend for the Cape May Warbler survey-wide in North America from 1966-2015 based on the federal Breeding Bird Survey (Sauer et al. 2017). 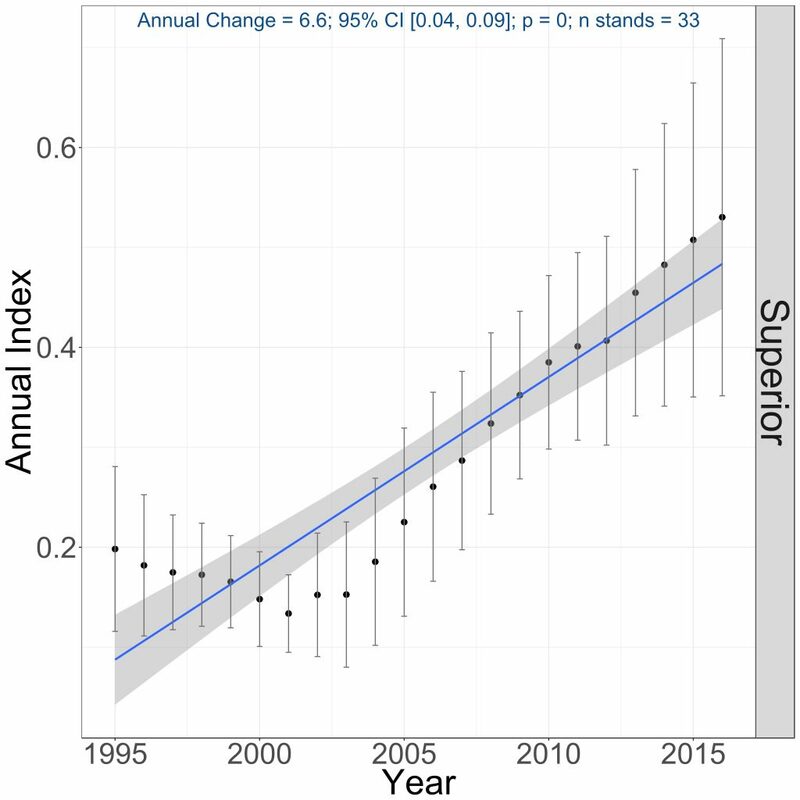 Breeding population trends of the Cape May Warbler in the Superior National Forest in Minnesota for 1995–2016 (Bednar et al. 2016). The Cape May Warbler has a moderate to high Continental Concern Score of 13/20 and has been placed on the the Partners in Flight Yellow Watch List of species of conservation concern (Rosenberg et al. 2016). The greatest concern for the species is its large population decline since the early 1970s. The stated goal of Partners in Flight for the Cape May Warbler is to reverse its decline by 8% to 12% between 2016 and 2028. A primary area of focus for reversing the decline is in the Southern Shield and Maritime Provinces Region in Canada, where they have developed a series of Bird Conservation Regional Strategies because the species is identified as a priority (Environment Canada 2014). Canada has 98% of the breeding population of Cape May Warblers. The Minnesota Department of Natural Resources (2015) has identified the Cape May Warbler as a Species in Greatest Conservation Need because of habitat loss and a potentially narrow thermal preference, which could limit its ability to adapt to climate change. Langham et al. (2015) and the National Audubon Society (2015) in their analysis of North American birds susceptible to climate change concluded that the Cape May Warbler is “climate threatened.” Their climate models indicated an 89% loss of its current summer range by 2080. This drastic loss of breeding habitat would require a rapid expansion of coniferous trees northward in Canada to maintain a similar amount of area and this is unlikely in such a short time frame. Cape May Warblers also have a preference for tall coniferous trees as opposed to the stunted black spruce that often occur near the Arctic tundra. It is unclear how this species will respond to future climate change, but the scenario does not look positive given its population is already declining. In addition, Cape May Warblers appear to have high mortality during migration. Loss et al. (2014) identified this species as having a high risk of collisions with low-rise buildings. They calculated its risk of mortality from building collisions as 16.7 times more than the average risk for a bird. Longcore et al. (2013) estimated their annual mortality at communication towers was about 1 million per year. Mortality from collisions was of most concern in peninsular Florida, where the warbler was ranked ninth of all species examined for this problem. Cape May Warblers suffer a high number of collisions in Florida because a substantial part of the North American population migrates from Florida to overwinter in the Caribbean. Interestingly, Terborgh (1989) suggested that the geographic restriction of the Cape May Warblers’ wintering grounds could also limit the species’ population. The future of the Cape May Warbler is dubious at present. Its population decline is likely due to many factors, including mortality during migration, the availability of a variable food supply (spruce budworm), and reductions in coniferous trees by logging, climate change, and lack of reforestation. Its wintering grounds also appear to be vulnerable. The population of the Cape May Warbler is clearly vulnerable in Minnesota and in North America. During summers with low levels of spruce budworm populations, the species can be very difficult to find in the northern forests. Because of threats throughout its life cycle, from breeding to migration to wintering, its future is definitely dependent on multinational measures to address these threats. Minnesota can do its part to aid in the survival of this attractive and beneficial warbler by maintaining healthy coniferous forests. Cottrille, Betty Darling. 1962. “A Search for Nesting Cape May Warblers.” Flicker 34: 38–40. Warner, Dwain W., and Douglas Wells. 1984. Bird Population Structure and Seasonal Habitat Use as Indicators of Environmental Quality of Peatlands. St. Paul: Minnesota Department of Natural Resources.